There's nothing like a little burn to keep a business meeting focused. CLARENCE, N.Y. — For anyone who has ever sat through a meeting with long-winded speakers and/or diet-busting doughnuts, Jennifer Baran offers an antidote. In her "walking conference room," there is no sitting through anything. Everyone is walking on treadmills or elliptical machines. The rest of the room looks like most any other meeting room with its monitor for PowerPoint presentations, conferencing telephone and coffee pot. Only here, participants work out while they work. "Exercise? I don't think so!" was teacher Michele Ganschow's initial reaction when her principal, Cherie Ansuini, recently called a staff meeting at the suburban Buffalo conference room. But a few minutes into the meeting, it was feeling like a good idea after all. "You're using your time more efficiently. You get to do two things at once," Ganschow said. "It's funny to see everyone's expressions on the machines," gym teacher John Grzymala said as he worked the elliptical while taking in Ansuini's presentation. "Probably I'm beet red," he said, drawing laughs from his colleagues. On the upside, comfy T-shirts and sweats replaced anything dry-clean only, and monitors on the machines flashed calories burned, a reminder that the meeting was productive from a health standpoint, too. Another benefit, this is not a forum where rambling off-topic tangents would be tolerated, or even possible. There's nothing like a little burn to keep a speaker on point. Baran said she was inspired by Dr. James Levine, a Mayo Clinic obesity researcher who assembled his own walking desk after publishing a study that found that thin people were on their feet an average of two hours more and burned 350 more calories daily than obese people. Things as small as pacing or fidgeting, considered non-exercise activity, made a difference. "We're trying to incorporate exercise into everyday life," said Baran, who has a Master's degree in social work and was recently certified as a personal trainer. She began her Healthy Living Support Network to offer nutrition and fitness education and motivation. The walking conference room is rented to businesses and clubs for $60-$80 an hour. 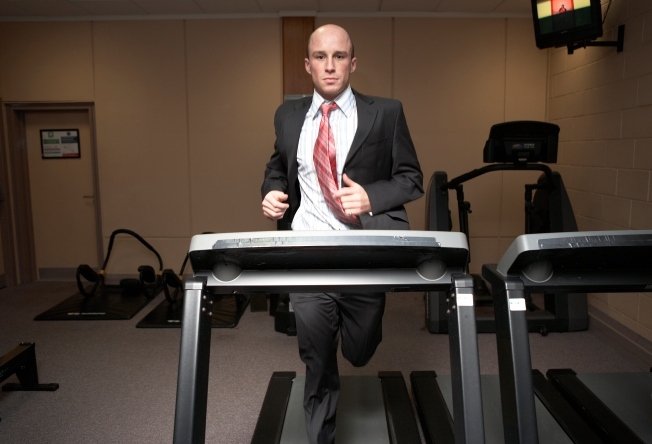 While most who attended Ansuini's meeting for staff at Nativity of the Blessed Virgin Mary School worked out at a rigorous pace, a slower gait over a longer period of time is beneficial, too. Craig Dexheimer was walking at 2 mph in full business dress, cufflinks and all, while talking about the two walking conference rooms at Salo, a professional staffing firm in Minneapolis. The company partnered with Levine beginning late last year to study the effects of incorporating more movement into the workplace, including using walking workstations with treadmills that won't go any faster than 2 mph. The pace is under the average 3 mph stride but allows workers to go along without breaking a sweat and becoming out of breath. At midmorning, Dexheimer, the company's director of operations and administration, had logged 4.3 miles and planned to walk until lunchtime. He said he regularly fields phone calls and gives tours of the company to other businesses interested in the idea. "You can check e-mail, you can log into the database," said Dexheimer, who had lost 25 pounds in six months, weight loss he attributes to a number of lifestyle changes that started with the walking. "There are certain things that are a little trickier to do while walking and that would be handwriting, making notes, just because you're bouncing around a little bit. "It takes about two to three days to get used to it. I compare it to almost having sea legs when you get off. But it's something your body gets used to," he said. Tethered with a clip that would stop the treadmill if dislodged, Ansuini delivered her pages of notes smoothly if a bit breathily while walking slowly on a treadmill at Healthy Living. The equipment's cup holders did double duty cradling water bottles and pencils. Acrylic clipboards at each machine held notes and provided a writing surface. "I have an article on each of your clipboards..." she said as the rhythmic footsteps and equipment's hum disappeared as background noise. "I think we're more productive because our energy level's high, our adrenaline's a little higher than usual," teacher Marc Bandelian said after stopping for water. And by meeting's end, he'd burned 268 calories.